Finding the right table for any setting requires knowing what to look for in them. We’re going to look at the three most common table types, and explain the differences so you know what to look for when deciding what type of table will match your kitchen or setting. The most common form of table is one of Standard Height. Standard Height tables are between 28”-30” inches in height and often come in variable lengths and finishes. Because they are often longer and wider as well, a table of Standard Height is best for a casual environment where gatherings or groups may want to relax and may be sitting together for a while. 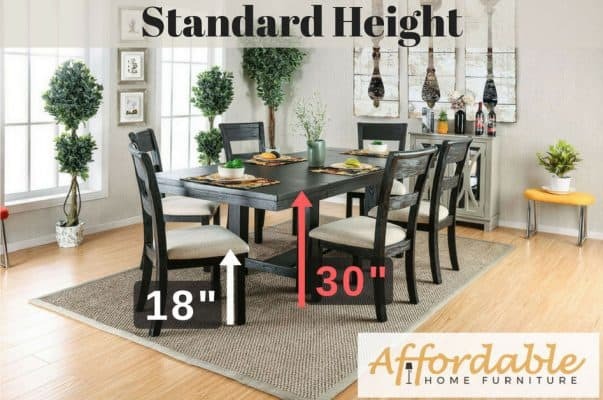 This can be especially useful for disabled family members or guests, as Standard Height tables are short enough to be comfortable for those who have trouble sitting at taller tables. Standard Height tables offer the best accessibility for a guest in a wheelchair and are comfortable for those who like to sit in a position that allows their feet to touch the ground or rest flat. Seating for a Standard Height table can be as low as 18”-20”. This seating makes the table more accessible for many people including shorter or younger friends and family and allows for a more variable kitchen or living room setting. The only drawback may be that the shorter height causes many to assume the table takes up more space, which is a common optical illusion. Counter Height tables often average between 34”-36” inches and are more useful in a kitchen environment than a Standard Height table. As the name implies, counter tables are closer to the same height as a kitchen’s counters and pair with chairs that put the sitting person higher up. This places them closer to eye level with standing individuals for a more casual occasion. 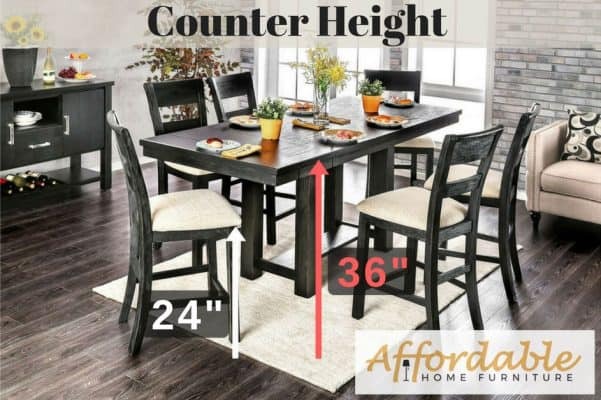 Because the additional height makes Counter Height tables seem more square than rectangular, it can give the illusion of taking less space in length and width compared to Standard Height tables. Counter Height stools can provide seating between 24”-28” in height, which you may prefer as it promotes moving about the room and prevents a sedentary lifestyle. Bar Height tables, also known as Pub Height tables, measure between 40”-42” inches tall. Despite the name, Bar Height tables are the average for home bars and are not commonly used in actual bars or pubs. Bar Height tables are much closer to chest height and make for a more intimate setting where one can easily converse with even standing individuals from a near equal height. Bar Height tables are often thinner as well as taller than other tables, allowing them to fit in unusual settings or places standard tables could not. They can also be placed in out of the way locations that offer some level of privacy and imply a sense of urgency that can make them great for those who will not be sitting long. The seats for Bar Height tables are not much taller than Counter Height table seats, at 28”-30”. 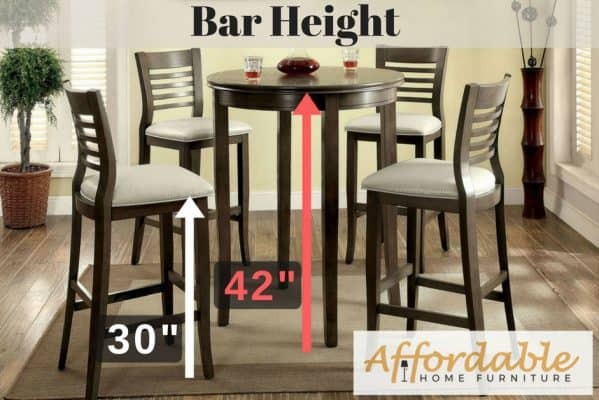 The small difference in heights sometimes leads Bar and Counter tables to be mistaken for one another, but Bar Height tables create a more vertical sitting environment because the stools have not become much taller. This is another advantage of a Bar Table environment’s casual nature.